Cat videos are a topic of hot debate, some people find them hilarious while a few others, not much. But one thing we all can agree upon is the fact that cat videos are a phenomenon. A phenomenon which has undoubtedly irked employers because the workers are easily distracted by them. 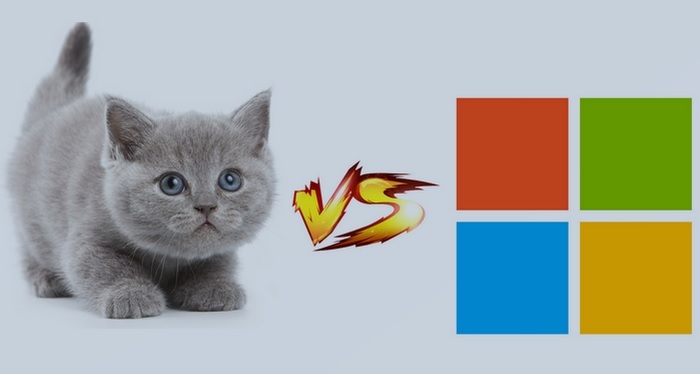 Microsoft seems to be particularly unhappy with the cat video trend, and has come up with a definitive proof that viral cat videos are playing a ‘meow-jer’ role in the decline of employees’ productivity. According to a report from Bloomberg, Microsoft recently conducted a survey involving 20,000 workers in Europe in order to assess the impact of digital technology on the productivity of employees. Well, the results are in, and they do not bode particularly well for cat video lovers, as their hobby has been found to be a source of negative impact on productivity. Microsoft identifies a number of possible reasons for this negative impact, including: workers who are too distracted by a constant influx of e-mails, Slack messages, Trello notifications, texts, Tweets – not to mention viral cat videos – to concentrate for sustained periods. But cat videos are not the sole culprit, neither is technology to blame for the loss in work output catalyzed by distracted workers. According to Microsoft, modern technology has resulted in a sharp growth in productivity, but only when it is utilized in a ‘strong digital culture’. As per the survey, workplaces with a strong digital culture witnessed a surge in passion and focus among employees when the use of digital technology was enhanced. On the contrary, companies with a ‘weak digital culture’ saw a sharp decline in productivity of employees due to the added distractions, causing their attachment to work wane over time. Microsoft’s findings are quite relatable, and they can be easily witnessed live in any modern workplace. And now that the Redmond giant has identified viral cat videos as a distraction, it remains to be seen how it tackles the ‘funnily serious’ issue.